Here we are again, ready for another fresh Snippets Challenge - anything goes so long as you use one or more 'snippets/scraps'. Least said about the continuing heatwave the better really - but we'll surely pay for it later on in the year due to cattle needing their Winter feed already and the lack of rainfall also affecting crops. - heart in mouth lest I wrecked the thing, it was time to do the little 'rips'. I used a water brush to just moisten a couple of lines down the card, above the claw marks and carefully tore down the lines before folding each side back - took me back to my mulberry paper tearing days! Oh what fun this stamp set is and this particular card isn't the only fun design of course. It was so quick and easy to make, with minimal colouring needed, and purrfect for a cat lover of course. Or anyone needing a bit of a laugh or cheering up. When you turn the card upside down, the expression on the cat's face is priceless! 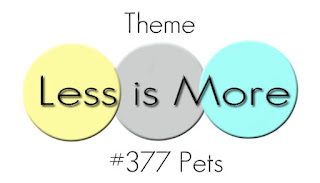 AND, it qualifies for the current Less Is More Challenge #377, which is 'Pets' - yippee, I love to play over there :) There might be a bit too much on the card, but I hope not as I still see plenty of white space and it really was such a joy to make. A few stamps, little bit of colouring. a couple of rips/tears and some layering. Oddly enough, one of the DT has a card using the torn paper idea - I made this last week well before the new challenge appeared though. It's a Your Next Stamp 'Scratch Pad' set of stamps, same as mine. We had a doggie set of stamps recently so I figured it was time for some feline friends to take centre stage and also be a prize. As always, the Snippets Challenge will run for two weeks and the Playground gates will close at 11am UK time on Saturday 18th August. The gates will open again at midnight UK time on the same day. Remember, if you link into the Playground and don't say clearly that you're wanting to be in the draw in a comment on here, then you will be bypassed if your name comes out of Mr Linky. I'm sure you all know I ask for a positive 'yes' on the blog post - just in case you're playing only for fun - otherwise I ignore you on my little list. Be sure to call back next week to see the fortnight's picks and the winner of the MFT 'Cross Stitch Tag' die set. Not as many entries so far this fortnight but who can blame people with the heat, holidays and also cross stitch isn't everyone's idea of spending time crafting. But it's lovely to see so many people still entering just for fun. uses YNS stamps ... love them! They have so many cute sets!! Will be back to play for the prize! Oh my gosh...this is so darn cute! I would love to win this very funny sentiment and image stamps set...It is such a hoot! Your card looks great. I love the look on the cats face! Will be back in a mo with my card. Your rips came out perfect, Di--I'd have had a heart attack! This is truly a smile making card--love it! I'll play just for fun this week. Ah ah ah!!! :D :D How FUN!! Pinned! What a super smile-making card this is - you certainly have the knack of sourcing some brilliant stamps and dies with which to tempt us!! I just have to say a 'yes please' for a go in the draw and will be calling into the playground later with my offering. Great to see that you are looking after your local wild life during this hot spell. What a great funcard is this. It makes me smile from ear to ear!! Your card and image is such fun Di. Already paying the price of the heatwave here in East Anglia, hay cut in June being fed by July as the paddocks are parched, unheard of to feed it so early, it's going to be a very expensive winter. Love it Di! Such a fun set of stamps, and I’ve never heard of them before either! A lovely card Di - the ripped paper at the top of your card is perfect! I'll be in the playground later and would love the chance of winning the prize please. My feline fur babies are glad to see that felines are being equally represented, Di. :-D Love the CAS design and those stamps are so adorable! I'm playing for fun this week, just adding to the number of cats in the playground. Have used my stamp set too but it won't show on my blog for a while as it is the latest card for my grandson. Never thought to do the ripped paper though. That is brilliant . Love your cat colouring. I did wonder whether to add Google eyes to mine but resisted in the end as going in post. Hugs Mrs A.
Hello, Di! Remember me? LOL, life is so busy lately! Love, love, love your cat hanging on for dear life! Very clever tears in the card front! I feel like that sometimes. Hope all is well with you. Sounds like you are enjoying the little critters in your garden. What a brilliant, fun card Di, LOVE this design! I'd love to be the owner of this set of stamps, so I'm a Yes Please for the draw. Oh, Di, I LOVE your card! So cute and I love how the kitty tore the paper! Adorable card! I'm definitely a yes for the prize! Your Next Stamp is one of my favourite companies - they are based in Canada, you know. I just linked up my card. I used a lot of my snippets as I did a lot of die-cutting - everything was in my snippets box, except the card base. What a fabulous image, so funny and with some really great sentiments too. Your card is adorable. And... yes please... I'd love the prize if my card is picked. Thanks! This card is so clever and so darn fun!!! I am imagining that design on all kinds of paper things ...notepads, magnets, cards, maybe even a scrapbook page about a tough week at work. Yes please to this adorable stamp set prize! Ha ha...this is such a great card Di, I love it! Yes please for the draw, thank you. Great card and great stamp set. This is so fun Di - love it! Finally made it over to link up my card. I almost forgot! The jet lag is fading now, thank goodness. I might even make into the craft room today! Yes please to the prize! I love how you tore the card to have the cat scratches on the top! This is adorable! I am definitely in for the prize this time! Glad your wild life is doing well. I have not heard of people feeding birds apple cores! I know our blackbirds are different than yours, but how much different can they be, right? Fantastic card and I love the idea of ripping the card. Yes please to the prize! 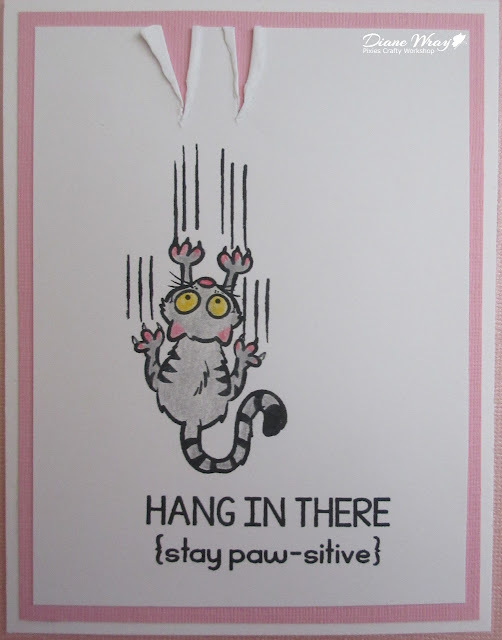 Hey Di, Love your kitty Kat Kard.. Too Kute (^_^) … I dropped off an early Thanksgiving Day card. 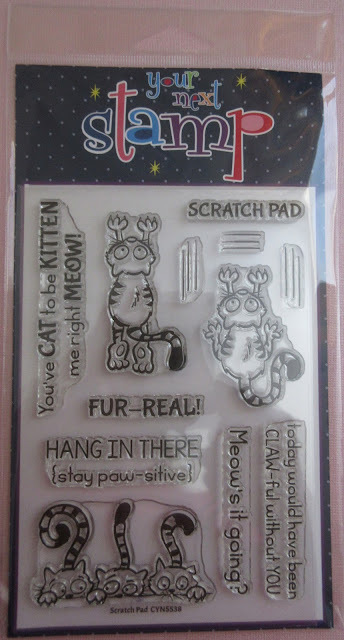 "Yes", I would love to be in the draw for this Kitty Stamp Set. Please. Thanks. Yes, I want to be in the drawing. Thanks. I maybe love dogs best, but your kitty card is super. It made me laugh out loud when I say it. Yes please Pixie, count me in - such a fabulous prize! Sorry forgot to put it's me - CarolG! So much fun with this cute image and giggled me a lot! Would love to win this super cute stamp set as a prize! He, he, he . . . so cute!! Kind of reminds me of what our little stripey does to the back door screen! Love the effect of the torn paper at the top. Would love to play for the prize this time, thanks! What a wonderful card, guaranteed to put a smile on anyone's face! I'd love to have a chance of winning the stamps, otherwise I'm going to have to buy them! such fun card, great design, Di. we are having here a heatwave too, yersterday we went with kids to the lake and today we are going to the mountains. I love a witty card, yours ticks the box :-) ... this image has so much potential, my sister is a cat lover - I'd love to have this stamp set, so yes please for the draw :-) Oh, and you're right; I turned my laptop upside down specifically to see "that" expression on kitty's face - what a hoot! Oh my goodness, this card is just hilarious!! The torn bit makes this look so authentic, and that stressed kitty pretty much represents myself most days. Yes please to this adorable stamp set. So happy to hear that the hedgies are still doing well in your garden and bless you for putting out water for the critters! I always worry about that when we have hot, dry spells. Love, love, love your fun and adorable kitty card!! Oh, my....that does have me laughing! This cat lover says "Yes, please....choose me, choose me!!" to this adorable set!!! I have several cards in queue...and I almost always use scraps, so I will be back soon to link one of them up! Thank you for the smiles today. All of us here in my part of Idaho are on edge because we have a severe fire weather watch on for tomorrow. We had to evacuate in 2015 because our tiny community was completely ringed with flames. We were fortunate to have a place to come back to....not everyone was. I think we all have a bit of PTSD from that experience every fire season. So I much appreciate the chance to laugh and enjoy your fabulous card. I'm joining in today with a card and a pic from our holiday in Wales. And I 've already told you before that I adore the stamps! Your card is an absolute hoot. Of course I have to be in the draw for this one. Hope your weather is getting better, I keep seeing different bloggers using phrases like "hottest summer in 150 years." It's what we live through every day here, but we have air conditioning just about everywhere so it's bearable, and I'm sure that's not the case in England. Love the cute card. And I am in for the prize draw. Would love to have a chance to add that adorable set to my stash! Love your fun card Di! I would love to win these fab stamps! My two little girls spent several days with their grandparents and made a whole batch of cards. They had a ball stamping, die cutting and coloring...and using snippets! I hope it's okay to enter my 8 year old's card, because she begged me to after she saw me uploading my own card. If she is eligible for the prize draw, she says Yes Please! Heee what a fab card Di! 100% yes to be in your draw please! Love this card! Fun design! Thanks for picking me as the winner last time! Looking forward to having a go with the die! What a super smile making card this is Di :-) I'm a dog pearson, but your cat is so sweet. I would love to win these fab stamps.